Special Edition Audio -- Eric has recorded a special edition podcast for this event. Please check this link. (click the red text). You are subscribed to the Sample List. This is premium content from the subscriber edition, sent as a bonus to all of our readers. Wishing you a happy eclipse, solstice and Yule. -- Planet Waves. Overnight tonight we will experience a total eclipse of the Moon in Gemini. This is the Gemini Full Moon, happening with the Sun on its last day of Sagittarius, just on the eve of the solstice. So we have a rare combination of a total eclipse within hours of the change of seasons. Though it may feel a bit edgy as it approaches -- especially with Mercury retrograde -- this is an event with the potential for resolution, closure and transition into something new. One nice thing about lunar eclipses is that they are visible wherever you can see the Moon. This one will be visible anywhere in North America that skies are clear. The exact Full Moon is at about 3:13 am EST, or 12:13 am PST, and the peak of the eclipse is listed as being about four minutes later. In some parts of Europe it will be visible just before dawn, low on the horizon. The Sabian symbol for this degree is a pageant of bathing beauties. Dane Rudhyar says of this degree -- which is right on the cusp of the Cancer solstice point -- "The show is over. Now is the hour of decision." That is a nice image of a pensive lunar event on the outer edge of Gemini, a dualistic sign associated with options and choices. Mercury retrograde is close to the Sun, on the Galactic Core at 27 degrees of Sagittarius. That reminds us that this event is aligned closely with the core, something evocative of the 2012 phenomenon. Recall that the supposed epicenter of that is Dec. 21, 2012 -- so it's now just two years until the turnover in the Mayan calendar's Long Count. Note that it's not the 'end' of the Mayan calendar, as is commonly misspoken, but the transition from the 13th to the 14th baktun. A baktun is 144,000 days or just over 394 years. This in turn is the last day of a longer 5,125-year cycle in the Long Count calendar. Note also, this is not a Great Cycle, as it's often mistakenly called -- rather, the Great Cycle is comprised of five 5,125-year phases (or one full precession of the equinoxes). Interesting to note that the Long Count calendar predates the Mayans and goes well past the diaspora and disappearance of their cities. Some of those cities are today hidden in jungle so dense no modern archeologist has been there. This bit about overgrown ancient cities, many of which likely remain undiscovered, was the most interesting fact I learned on a Discovery special on 2012. 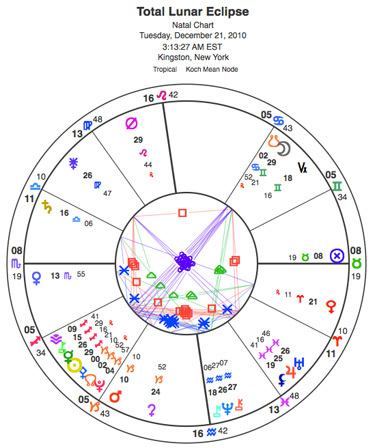 Gemini Full Moon synchronous with a total lunar eclipse in the last degree of Gemini takes place overnight Monday to Tuesday in U.S. time zones, and early in the morning in the U.K. and across Europe. It will be in the early evening in Australia. Note that some listings will place the peak of the eclipse approximately four minutes later than the Full Moon. Whatever the 2012 phenomenon signifies, we are in proximity to it at this time of year, and at this time in history. If you want some clues, feel within yourself and look at a newspaper. In order to get information you may need to shift your perspective a bit and see things in a wider context that includes you. There is no universal acceptance or even a consensus among Mayan scholars or New Age followers of the calendar about what this event might represent or predict, but we know we live in a time of enormous change. The questions seem to hover around two points -- the meaning of that change, and how we and it mutually influence one another. Based on both Western and Mayan astrology, we are well within those events and growth processes now. This sense we have that the world is changing and (perhaps) that it would be a good idea to catch up to those changes, or jump in and play, is becoming pervasive, but so too is this sense that we're victims of whatever is going on. Since the Mayan change is an Aries Point event (happening on the change of season), the prevailing theme is how the personal and the political, or the public and private spheres of influence, affect one another. This is not a matter of theory, it's a matter of practicality, involvement, decision and action. Tonight's eclipse, situated on the edge of the mutable signs, has a feeling of flux. There is a reminder to be flexible about our ideas, represented in the signs Gemini and Sagittarius. It is impressive how fixated on our old ideas we can be, even though we may have no idea what they are, or how scant of a basis they may have. The Sun enters Capricorn later in the day Tuesday (Wednesday in some non-U.S. time zones). This is the solstice but remember these few nights are all about the same length with the Sun (sol) standing still (stasis) along the horizon. The Sun meets the asteroid Pallas Athene in the first degree of Capricorn. Pallas is a politically interested critter, and so is the sign she is now in. We are certainly in times where the political environment has taken on an exaggerated dimension of meaning. I believe this about our neglect of politics -- that is the obvious means by which the game runs out of control. Philosophical implications aside, we are at a change of seasons, and that is exciting. This always comes with a surge of new energy and sense of adventure, and we can use it. Here in the Northern Hemisphere, even as it becomes winter, the dynamo of the cosmos reverses directions and the days get longer. It's not so much that we'll cash in on the extra few minutes of sunlight every day but more that the sensation of compression will be replaced by a sense of expansion. The Full Moon going dark when the days are their shortest, just at the solstice point, marks a distinct transition, and also a reminder to ease through the events and sensations that surround our particular moment. Ease, as in easy does it. Remember that from the moment of the eclipse forward till it enters Capricorn later in the day, the Sun will be void of course. Whenever that happens, the veil between us and unusual or unlikely events can feel thin and penetrable. Often these developments can be fun or intriguing, offering an opportunity to fulfill a hope or dream; they are also good reminders to be conscious, drive carefully and make alert choices. As this eclipse is suggesting, the show is over, and now is the moment of decision. Copyright © 2010 by Planet Waves, Inc. All Rights Reserved.